Our tip for this month relates to something that most of us take for granted: Addressing your Mail. According to the USPS, the speed and handling of your mail if affected by the accuracy of the mailing address you have provided. 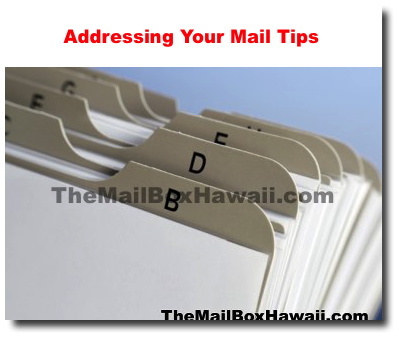 So here are some simple items you should consider when addressing your mail. 1. If you have a PO Box and Street Address, you may use one, but NOT BOTH. Be sure to include any directional info in the address (such as SE or Southeast) as this will help locate the final destination of your mail. 2. If there is an Apartment Suite number on the address, be sure to use it as this as well. 3. Use the correct ZIP code as this helps direct your mail more efficiently and accurately. To find a zip code, visit <A HREF="http://www.usps.com" target="New">www.usps.com</A> or call 1-800-ASK-USPS. 4. A return address is required on most mail so be sure to include one. 5. Place the delivery and return addresses on the same side of your envelope. The addresses should be written parallel to the longest side. 6. Type or print clearly so that the address is legible from an arm's length away. 7. Military addresses must show full name with middle name or initial and the PSC number, unit number, or ship name. Replace city name with APO, FPO or DPO, and the state with AA, AE, or AP, and use a special ZIP Code.